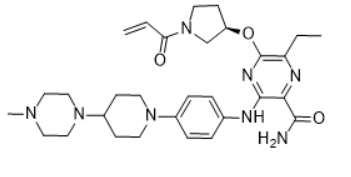 Naquotinib, also known as ASP8273, is an orally available, irreversible, third-generation, mutant-selective, epidermal growth factor receptor (EGFR) inhibitor, with potential antineoplastic activity. Upon oral administration, ASP8273 covalently binds to and inhibits the activity of mutant forms of EGFR, including the T790M EGFR mutant, thereby preventing EGFR-mediated signaling. This may both induce cell death and inhibit tumor growth in EGFR-overexpressing tumor cells. EGFR, a receptor tyrosine kinase mutated in many tumor cell types, plays a key role in tumor cell proliferation and tumor vascularization. ASP8273 preferentially inhibits mutated forms of EGFR including T790M, a secondarily acquired resistance mutation, and may have therapeutic benefits in tumors with T790M-mediated resistance when compared to other EGFR tyrosine kinase inhibitors. Synonyms:ASP8273; ASP-8273; ASP 8273; Naquotinib free base.